Everyone these days have their attention towards Kylie Jenner? Why is Kylie such a head turner, because lately she has been discussing all her beauty secrets and favorite products? Before your mind tells you “hell ya, like I can afford what she recommends” and close this tab just wait and keep reading as you are about to get a big shock. Kylie’s most favorite products are found in places that are actually affordable for everyone. Chances are you probably shop there every day. In an interview with a popular website, Kylie revealed that she is a frequent shopper at the Beth Bender Beauty. Why Kylie is such a big fan of BBB? Because she buys her Cat Eyeliner Stencil & Smokey Eye Makeup Stencil from there. Now who would have though a famous star like Kylie will be shopping at BBB for eye stencils, you must be thinking that Jenner’s flirty lashes must be custom made lash extension or by applying some $150 mascara. Recently Kylies overall look and makeup has become the most gossiped topic it the world of beauty and style among the young women everyday trying their best to nail Kylie’s look. Well, guess what, we have actually come across some cool products that Kylie uses for getting her hot look. Here we are breaking it down in step-by-step guide for you to follow it and don’t get confused. Truly Kylie’s beauty comes with two things lashes and lips. 1. Kylie use Nip and Fab Dragon Fly Serumfor keeping her skin hydrate and she keeps this product every time with her as she might need it. 2. Kim Kardashian uses La MerBraod Spectrum SPF 50 sunsreen for protecting her skin on a daily basis. And anything that Kim applies is surely adored by her sister Kylie. 3. You will always fine Kylie shining and she has admitted that she uses a spray tan. Khloe’s go-to this sunless tanner by Kardashian brand is something Kylie’s using too for her tan. 1. Since Kylie is a big fan of contouring her makeup artist Rob Scheppy says that Makeup Forever Foundation Palette is best for creating her look. 2. Kylie’s look is never shiny its always matter and that’s because she tops off her foundation with matte powder (Makeup Forever Super Matte Loose Powder). 3. 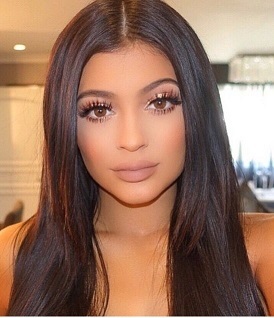 Like we already told you before Kylie’s go-to look is bronzed and tanned. This palette offers the perfect bronze for cheeks with a shimmery highlighterto go on the top. 1. 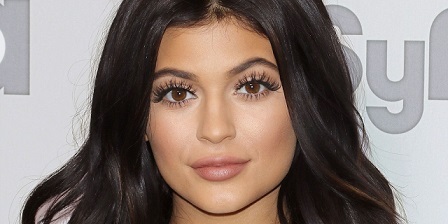 You can get Kylies look but if you don’t wear big long luscious lashes then you won’t hit the right spot. But I bet you didn’t know that her lashes are fake. She gets her eyelashes from BlinkBar, where she has been going for two years to get lashes extension and they use every type of lash, mind you these lashes aren’t expensive. 2. Kylie also tops her eyes with a thin cat eyeliner, she is a huge fan of online eye makeup brand Beth Bender Beauty, but if you can’t get that then try Smokey Eye Stencil. 3. Even with lash extension Kylie uses Eyeko Mascara to add extra volume to her lashes. 4. When we said that Kylie is a big fan of Eyeko brand we weren’t kidding you will find Kylie using everything from this brand for her eye makeup. To get the Kardashian/Jenner look you need to make sure every part of your eye looks great, even your eyebrow. 1. Of course you can’t attempt to get Kylie’s look without focusing on her voluptuous lips. She preps her pout with Elizabeth Arden Eight Hour Lip Repair Balmbefore adding any color to give a soft and luscious look. 2. As we've talked about earlier, Kylie normally just shakes lip liner and lip balms instead of lip sticks. She traces the external edge of her lips to make them seem greater. Utilize this skin-conditioned liner (MAC Naked Lip Liner) to line outside the lips before adding shading to keep things slick and clean. 3. Kylie has said over and over that MAC lip liners are her top pick. Her go-to shading is Whirl, which she uses to line and fill-in her mope.